(Kampala, April 8, 2004) I arrived in Uganda on September 15, 2003 to begin my first year as a Mickey Leland International Hunger Fellow, placed with the United States Agency for International Development’s Uganda mission. A few months before I arrived I was told that I would be acting as the Humanitarian Response Coordinator for the mission, working on emergency projects in response to the conflict in northern Uganda. I am ashamed to admit that at the time I had almost no idea that this war even existed. Like a lot of the world, when I thought about Uganda at all it was as an African success story, the country that had lowered its HIV/AIDS rate from over 30% to 6% in ten years, the Pearl of Africa. The story of its 18-year war was a revelation to me in more ways than one. 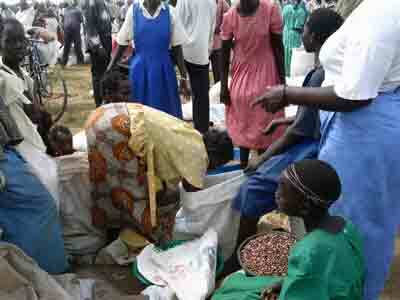 Women divide a sack of beans among their households during a distribution in Opit IDP camp in northern Uganda. Food aid provides roughly 50% of the daily food needs of internally displaced persons (IDPs). For almost two decades now, the Lord’s Resistance Army has waged a campaign of terror on the Acholi people. Rebels murder, maim and abduct thousands of men, women and children each year, forcing hundreds of thousands of people to flee their homes for the relative safety of congested displacement camps. I had been in Uganda for a week when I saw a camp for internally displaced people (IDPs) for the first time. As a typical child of the American suburbs, my imaginings of what a “refugee camp” looked like owed a lot to television news and media pleas from international relief organizations depicting abject, helpless Africans. What I saw was heartbreaking, but different from what I’d pictured. I walked around the camp with a column of children tailing me at a safe distance, stepping over the open sewage ditches that crisscrossed the camp and watching moonfaced malnourished children play in rubbish heaps. Women and children stood in endless queues waiting for a single jerrican of water, which my companions explained was better than risking abduction and illness to collect water from the muddy ponds outside the camp. Men, unable to leave the camp to work in their fields, sat in despondent clusters, staring and drinking waragi. But what I felt most strongly was the settled, inured mood of the place and people. The Acholi have been living in displaced isolation for more than a decade, cut off from the outside world and even the most basic services. In the face of chronic fear and deprivation, they have exercised that most human of traits: they have adapted to their conditions, appalling as they are. I had come to the camp with a World Food Program convoy bringing food aid to its residents. Cut off from their land, the IDPs are almost wholly dependent on their rations of beans, maize, vegetable oil and corn-soya blend (CSB) donated by the US and other industrialized nations. The general food distribution sent a thrill through the camp as (I was to realize later) does any visit the IDPs receive from the outside world. Women materialized from the huts around the clearing with basins and sacks on their heads, children ran laughing through the crowd, scooping handfuls of spilt CSB into their mouths, and old men shook my hand and thanked me for “the food from America.” I felt deeply ashamed. I was aware of myself as the walking embodiment of overfed western carelessness, but as I moved through the crowd I was greeted with grateful smiles and blessings from all sides as if I were some magnanimous, selfless benefactor. As if I personally was responsible for the IDPs’ good fortune that day. Just weeks before, I had had no conception of these people and their lives; they had not existed to me and now I was being thanked for acknowledging their presence and their plight. It struck me that the sacks of grain being unloaded from the trucks represented millions of Americans just like me, well intentioned and yet mostly ignorant of the consequences of our actions. During the seven months I have lived in Uganda, the number of people displaced by the war has risen from 800,000 to more than 1.5 million and has spread to cover eight districts. Every week there is news of more deaths and abductions, every few days another bloody scene is splashed across the front pages of the national newspapers. But in my time here I’ve realized that the victims of this war are not the helpless Africans of American televised lore, and that while our aid may be of assistance in the short term, we need to avoid confusing people who need help with helpless people. These are people, families, who are trading away part of their households, their culture and themselves in order to survive in a world they had no part in making. This is life’s reality for more than 35 million refugees and IDPs around the world. Due to lack of classrooms and teachers in the camps, many IDP children cannot attend school, especially girls. When I think about the world in these terms, I can’t help but feel overwhelmed by responsibility, and the knowledge that as an American I am complicit in the suffering of so many people. But being complicit means I have a hand, a choice in the way the future plays out. My time in Uganda so far has showed me that the first step in that choice is to keep my eyes open and next, not to let the things I see make me feel I am helpless to act for change. This is how Uganda’s forgotten war has helped me to remember my place in the world. This year Hunger Notes will publish articles and letters from the Congressional Hunger Center’s Mickey Leland International Hunger Fellows to give our readers a real-life sense of what hunger looks like around the world. This program, named after former U.S. Representative Mickey Leland, sends fellows to work with the world’s leading anti-hunger organizations so they may know what hungry people experience, and so they may then have better tools to craft policies and practices that serve these individuals. Because Leland Fellows live and work in places like northern Uganda, southern Sudan, Bolivia, and Indonesia, they have first-hand knowledge of issues that can cause food insecurity – issues like HIV/AIDS, conflict, poor governance, and drought. More importantly, they know real children, real mothers, and real grandparents who shoulder the real problem of global hunger. What is to be done about hunger? The Leland Fellows will share their stories and struggles in responding to this question here in Hunger Notes. For more information about the Congressional Hunger Center and the International Hunger Fellows program visit the CHC website. 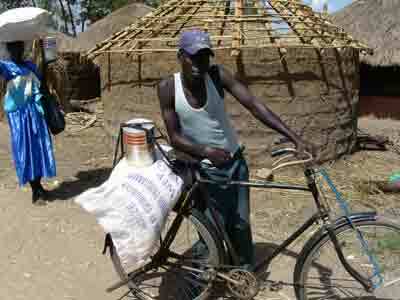 A young man transports his family’s ration from the distribution site to his hut at Opit IDP camp in northern Uganda. A severely malnourished girl receives some fortified porridge at a therapeutic feeding center at Gulu Hospital in northern Uganda. It is estimated that only 20% of children in need of supplementary feeding in northern Uganda actually receive it.